Can you tell us a bit about your company, who you are, and what inspires your music selection? We are Voice Media Partners, a company that was founded by two people with only a dream and now we are slowly taking over the digital publishing market. I am originally a published author and have been working with different bands for years on many different projects, but just within the last almost two years we have started to work in music production and distribution. These days people can distribute their music through major outlets, but we not only distribute the music, but we do more then just distribution. We brand the bands and the music and create a substance that many artists cannot do on their own, as well as use our contacts around the world to have successful campaigns. So the band you are working with called All New Episode is releasing a new Album across the U.S., Canada, and U.K., that’s very exciting, can you tell us more about your launch plans? Yes, we are distributing the band through several countries including the ones you mentioned, but also through Sweden, Ireland, France, Belgium and a few others. We are doing product placement to have the band’s music played on different online radio stations as well as radio stations here in the USA and traditional stations in the UK. We are partnering with leading mobile phone companies in several countries and offering many distribution options for people to obtain this music. Tell us about your Album called “Signature Edition” and the story behind it? Signature edition includes some new music and when we were designing the cover for All New Episode, we wanted to encompass the title of the album. We actually came up with the title based upon the marketing plan and add on that we were going to include for buyers of the album. The musical genre of Signature Edition is what we want to include in the cover. We feel that the punk, ska and alternative feel is represented by the cover we designed for All New Episode. You’re also debuting with a hit song titled “A Huge Mistake” – and giving away signed physical copies for people who buy the digital album, great idea by the way, can you tell us a bit more? Yes, so signature edition is much more than a title. The concept is to offer new music and give some different types of songs in the album that show the range of Signature Edition. The reason why we are calling this Signature Edition is because we are offering physical editions of the album that are endorsed to the buyer. There is only one way to buy this album which is by sending us a copy of your of the album that are signed by each member of the band and endorsed. Voice Media Partners felt this would be a great way to offer fans a option to not only receive the album, but also a special edition copy that was endorsed. We are going to have some add ons for the album with exclusive cover art work as well as other bonuses. We are looking into adding some remixes to this special album and are having DJ’s and mixers seeing if they can mix some special sounds. There are some additional bonuses we are adding that will not be released that you will just have to buy the album ot find out about. Now that you’re working with a popular up-and-coming band, how has your company changed since working with them? I think that Voice Media Partners has really grown with working with All New Episode. We took on a huge project and originally our goal was to go nationwide. However, we wanted to go above and beyond this. We wanted to do something that most indie bands were not doing and deliver above and beyond the bands expectations and our own original expectations. We have shown people that we can work with bands and deliver on a scale that shows how we can make a band successful. I think this experience was great and we continue to grow with our projects with the band. If anything, I think that this opportunity strengthened our company and gave the band a great opportunity to partner with us. Your company is also going to be featuring All New Episode in an upcoming independent movie by Voice Media Partners, congratulations! What role will you and the band play in the production, and what’s the plot about? The band was asked if they wanted to participate in an animated film we are producing called “The Kenny and Sarah Show.” The plot is about two crazy teenage kids from Salt Lake City, UT. They are trying to go to see their favorite band All New Episode who are doing a special appearance for their album Signature Edition. These teenagers decide to go on a road trip to see All New Episode perform in West Palm Beach, FL. They have some fun adventurers, meet some new people and make some stops along the way such as in Cheyenne, WY, Lincoln, NE, Kansas City, MO, St. Louis, MO, Atlanta, GA, and Orlando, FL, before getting to West Palm Beach, FL. We have a very good cast and we are going to make a family friendly film. Now the band will be having a cameo appearance in this film but it sets the stage for the second film which we will be making and have released in 2015. The first installment of this series will be released in the winter of 2014. Is the band going to be touring in cities across North America during this albums release? We are not sure how the band will be touring. We know they will be doing shows in New York, but we have not made any plans with them for a national tour. We have not set to represent the band for tours. So we will see what develops. Where can we find out more about your news, videos, and the bands albums? 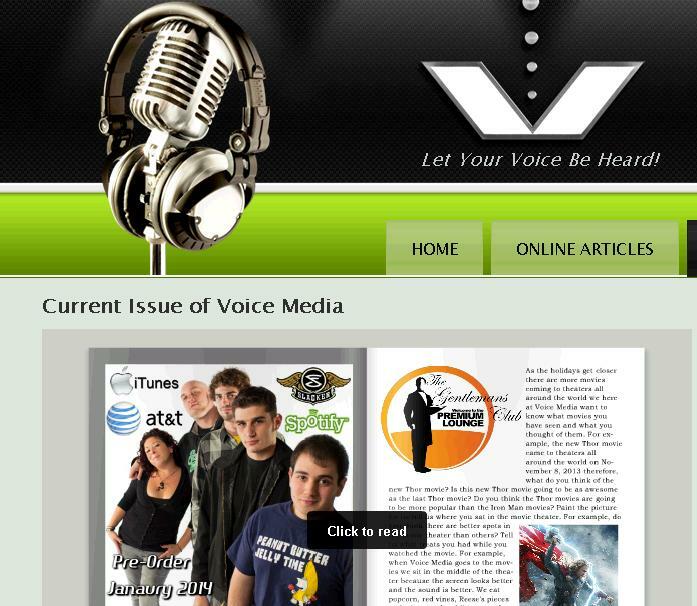 You can visit the bands website @ http://www.AllnewEpisode.info or you may also visit our website http://www.VoiceMediaPartners.info and Facebook.com/VoiceMediaPartners to see our current information.